Witchcraft is a theme that has appeared over and over again in horror movies. It seems like there are no more fresh takes that can be done on the subject. Enter: Rob Zombie. 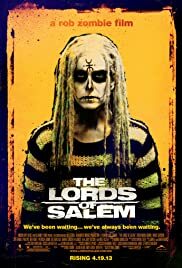 Rob Zombie’s The Lords of Salem is my pick for Day 2 of 31 Days of Halloween. Rob Zombie has been criticized for being all style and no substance, but he’s still one of my favorite filmmakers. His style is so unique. The last 10 minutes of this movie are practically art house and feel like a waking dream. It’s one of the best movie endings I’ve ever seen. The flashbacks and the present-day are all loaded with interesting imagery and symbolism. The witchcraft seems very literal, but there’s also a quality in the atmosphere of the film that makes you question this perception. The film closely follows recovering addict Heidi, and since it’s kind of filtered through her, there’s a question about the reliability. Either way you interpret it, this one is one creepy roller coaster ride of emotion.